If you live in the Phoenix area, like I do, and have ever wondered why a city was built "way out in the middle of the desert", you need to take a second look at the geography. Phoenix is on the edge of a desert. 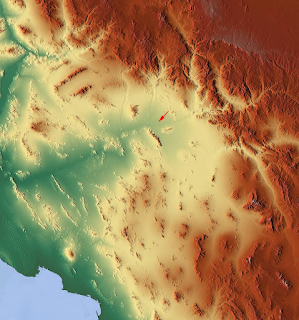 The map above shows a satellite view of the Sonoran Desert. To the lower left is the Gulf of California, and at right are the uplifted areas of Arizona. The arrow shows the Salt River Valley, which is where Phoenix is. So, from a geographical point of view, Phoenix is in a wonderful position to take advantage of the annual runoff from the uplifted areas. The water flows from northeast to southwest, and empties out into the ocean at the Gulf of California. It may not feel like it when you're driving around Phoenix, but Arizona tilts towards down (towards sea level) southwest. The main advantage that the pioneers saw in the Salt River Valley was the fertility of the soil, watered annually by flooding. The trick was, and is, how to control that flooding, capture the water that goes by every year, and use it for agriculture. The Hohokams did it for hundreds of years, and the pioneers did it, with moderate success, until the Roosevelt Dam was built in 1911, which ended most of the catastrophic flooding in the Salt River Valley. But agriculture hasn't been all that important in the Phoenix area for a long time. At the risk of sounding like the Chamber of Commerce, being on the edge of a desert means that you can play golf in the valley, and go skiing two hours later up in the mountains. If you get tired of the 100-degree heat in the summer in Phoenix, you can be enjoying cooler temperatures just by taking a short drive northeast. If you fly over Phoenix, you see the immensity of the Sonoran Desert, and the mountains just on the edge of Phoenix. Out in the middle of the desert isn't a good place to be, but on the edge of the desert is a great place to be!